I have too many clothes. I remember thinking this over and over again as I walked down my rickety apartment stairs towards the car. I was carrying two 50-gallon trash bags filled with clothes – and that wasn’t even all of them. I had another 50-gallon trash bag filled with shoes upstairs waiting to be packed into the car for the move from Bloomington to Indianapolis, Indiana. I even had a couple armfuls of hanging clothes already in the car. I estimated that my clothes weighed at least two times what I weighed – I felt so encumbered and overstuffed. That’s when I started looking into how to simplify. A quick Google search led me to discover my first minimalist/simple living blogger: Courtney Carver. I started to learn about Project 333 and started to realize all the things that weren’t necessary in my closet (I had a beaded evening gown thrift store find that I just couldn’t get rid of – but never wore). 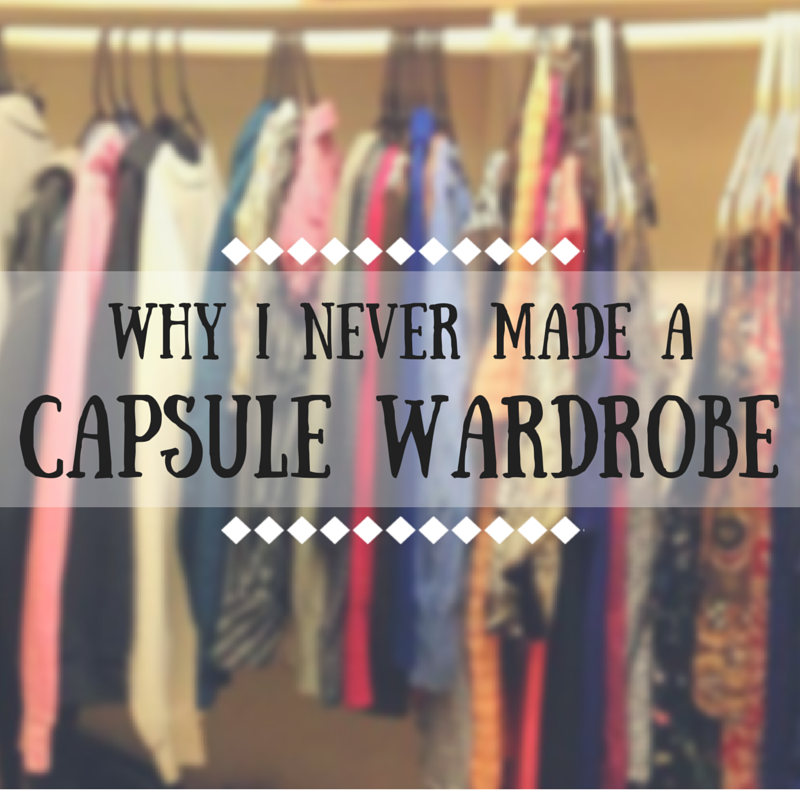 I found out about capsule wardrobes and was really excited by the idea! If you’re unfamiliar with the term, a capsule wardrobe is when you select a certain number of items (including jewelry, accessories, etc, but excluding essentials like underwear and workout clothes) and only wear those items for a set amount of time. It’s an excellent practice to get into when you’re trying to live with less. Although I’ve never tried it, it sounds really fun and challenging! I’ve never done it because I’m (a former) packrat. I’m the “just in case” type of mild hoarder – the person who keeps notebooks for years just because they have five pages of free space. I felt like, for me, a capsule wardrobe might encourage me to keep the hundreds of pounds of clothes just out of sight. They’d still be there, like a safety blanket (which, ironically, my “blankie” is the one childhood thing that I will not get rid of). And it was having too many clothes that drove me crazy in the first place. I’ve gone from having a packed dresser and an oversized closet stuffed with clothes to only needing two drawers and about 2 feet of space on the clothes rod. It’s not hard! And in fact, it’s amazing – I didn’t realize how little I cared about my clothes before. Now, I cherish each item and can’t wait to wear it. I love every piece. Yes and no. If style is important to you and having cute season-specific clothes fulfills you, then by all means, wear your fall scarves and Christmas sweaters. But a basic dress looks great in all seasons – just add leggings and cardigans when it gets cold. My non-expert advice: stay away from super-trendy colors unless they’re really colors you love. Pick pieces you can see yourself wearing to holiday parties and to summer cookouts. If you must, choose reversible or season-less scarves and stick to neutral jewelry. Having a lot of clothes doesn’t make you stylish. Having few clothes doesn’t make you boring. It’s all in how you wear them. Have you tried a capsule wardrobe? What did you think? This entry was posted in Home, Minimalism and tagged capsule wardrobe, clothes, fashion, get rid of stuff, lifestyle, minimalism, simple living. Bookmark the permalink. In my opinion, what you have done is just as much of a capsule wardrobe as anything! I have been trying a capsule wardrobe for a few weeks now and I love it. At least the change and how it’s made me so much more aware of what I’m buying. Plus the fact that I’m no longer staring at clothes I don’t like, which makes getting ready in the morning so much quicker. I think the initial purge is just what I needed. Not having all the clutter is so nice! I did the same thing as you did. I just add in scarves, hats and a coat when the weather turns colder. The rest pretty much stays the same year-round. I really like your approach to this. I think you have captured the objective of what a capsule wardrobe is meant to achieve. I have yet to tackle my wardrobe. It has to be done, I have too many clothes I don’t wear and they are just getting in the way. I am attracted to the KonMari method of getting everything out and going through all of it at once, but I really love your reasons to keep things and especially reasons NOT to keep things. Oh I can hear myself saying some of those things! Thanks Amy! It’s been really fun, and I don’t think it’s completely done just yet. It’s been such a rewarding process. I feel so much better than I did before! I definitely recommend doing it in steps – on the first day, just get rid of things that are a definite no. Then go back through maybe a week later and get rid of things that are “meh…maybe not”. And you’ll start rolling! The KonMari method is something I wish I’d discovered earlier, because I think it would have helped me process things more quickly right from the start. Good luck with everything, and thanks for reading! I live in southwest Missouri, which is one of the most prone-to-changing-weather spots on the planet. I’ve literally seen days where the temperature has swung by 50 degrees! I’m not a big fan of the capsule wardrobe approach partially for that reason – in the summer, I can move most of my jackets and sweatshirts to the back of the closet, but I don’t like putting them up completely. And there have been occasions where I’ve reached for a pair of capris in January. I chose to take a different approach – I went through and eliminated over half the clothes from my closet, and I’ve chosen to be very mindful about what I now have versus what I want and need. I feel like this is a good compromise because it gives me “permission” to buy a couple things I want for fall/winter (another long-sleeve button up and a couple Breton striped shirts), but it keeps me mindful of what I don’t need to buy (jeans, T-shirts). I do like the idea of having as many multi-functional pieces as possible – I can wear a tank top by itself in the summer, or layer it with a cardigan and scarf for winter. Or, on those fall days where things are in between, I can layer it in the morning and have bare arms in the afternoon! I agree – it’s so important for me to always know what I own and to have what I need on hand, because I’m prone to impulse buys if I don’t have a good grasp on what is already in my closet. Layers are where it’s at! I haven’t quite mastered the “layered” look, but I sure love piling on extra layers. It’s so helpful, especially in the midwest when temps can be so unpredictable. Thanks for sharing! It’s so weird that you’ve written on this subject! I just found your blog a couple weeks ago (so great btw!) and Im currently trying to figure out how to create a capsule wardrobe myself. I think for me, I’m just trying to reduce the amount of clothing that I have so that I don’t have to spend too much time trying to put an outfit together every morning. I also tend to buy cheaper/trendier clothing and at this point in my life, I’d like to spend my money on more classic/quality pieces. Thank you! I totally agree on just reducing clothes in general. I don’t have to think – I just grab the first dress or shirt that I see and I know I’m going to love it and look good in it. In college, I bought a lot of the cheap/trendy stuff, and I’m working on avoiding that. It’s so difficult. But whether it’s expensive or cheap, I now make sure it’s something I actually need and can see myself wearing regularly. No more $4 dresses that will immediately get shoved to the back of my closet because they’re really not my style. Great post!! I agree!! I keep mostly blues with my neutrals, but I have a dash of pink in the form or a cardigan and one dress that add my personality on more fun days!! I will happily wear them in the winter or summer! Your attitude and philosophy are sensational. You have made such inspiring progress!! Thanks for sharing! Love the name of your blog, btw! I liked the Capsule Wardrobe idea too, but you’re right about having clothes out of sight. I liked the idea of building outfits from a small selection of options, so now I am moving towards more of a uniform made of a few good pieces. My colors are navy, teal, and coral. Going for a clean classic look. Good call and great colors 🙂 Mine are similar – I just add in pink since it’s my favorite color and blacks, greys and whites. Thanks for sharing! I agree – instead of having rules to follow, I prefer to nix the rules and instead just keep things very simple. This is how I feel! Thought I was the only one 🙂 It’s true that you can just easily add leggings and a cardigan to something for “Summer” and make it a Winter item as well. I’ve parred down a ton, but don’t see any need for a capsule wardrobe either. I love every item I have and don’t feel a need to rotate them in and out, or especially hide them from sight. I feel like doing that might make me feel the need to buy more things to fit the season, and not exercise my ability to get creative to mix and match every item I have. I’m proud of what I’ve accomplished so far, and can’t wait to see what else I can cull. Having the option to pack extra clothes away seems like a way for me to hold on to more than I need. Seems kind of reverse of minimalism! I agree – I know I would hold on to a lot more if I packed stuff away. Thanks for sharing!